Few of us would imagine building a house without a blueprint. What if you were offered shares in a company you know nothing about – would you jump in, totally blind? Highly unlikely. How about moving to another country without doing any planning or research first? Probably not. Strangely, when it comes to small business – arguably the most risky financial investment you can make – business owners usually jump in with brazen optimistic abandon. In my 12 years as small business consultant, I have seen business planning (in any shape) in less than 5% of small businesses, with only with 1% treating planning as an ongoing practice. We would all agree that dedicated forward planning is of enormous value to any business, yet it still remains an undervalued, uncommon practice in small business. So let me give you a literary kick up the behind to do some kind of planning in your business, shake off the myths and disarm the excuses. The first roadblock of business planning is the ‘business plan’. The point of business planning is not to create a nice looking document. Business planning is an activity not a document; it is a process not an end. Start thinking in terms of a regular fitness regime for your business. It is a process that you undertake to plan, research, learn, strategise, discover, ask questions, identity risks and work out how you will make your business work. Your business plans simply documents everything that you discover and all of the decisions that you will make along the way. The exact format is not important; it just needs to work for your business. Personally I use spreadsheets and have separate worksheets for each area like financials, marketing, goals and actions. Other types of documentation I have seen include mind maps, flow charts, tables and the well-know polished business plan. What counts is removing yourself from the day to day operations to review, research and future think. One of the biggest challenges of owning a small business is the number of business functions that you need to manage at once. You will need to make decisions on a staggering range of issues, which could include anything from hiring staff, deciding where you will spend your marketing, managing cash flow, getting your clients to pay you and maintaining IT systems. In your planning process you will determine how these functions will operate, so you will be better equipped make effective decisions that are consistent with your overall plan. That is because you are not just making it up as you go and hoping for the best, but you will actually know what the plan is. When you are faced with a crossroad on your business journey, you can go back to the road map, reorient yourself and feel more confident that you are going in the right direction. Most small businesses operate with a trial and error approach, trying out random approaches each time they have a problem to solve, making decisions on the fly and hoping the new approach will work better than the last. Avoid this method at all costs: it is a very good way to waste your money and time and can risk your business. You can easily spend your way out of business. The imperative is to make decisions with your eyes wide open, to minimise risks and maximise the chances of success. Some of your business decisions are small, operational decisions that just keep your business going, but there are some bigger important decisions that will involve you spending a lot of money. For example, choosing stock for the next season in your retail store, deciding whether to get a new website, hiring a new staff member or doing an advertising campaign. It is so easy to get these decisions wrong and to end up with a bad staff member that scares your customers, no results from your advertising or a nasty tax bill. All of these can be better avoided by doing research and planning, by drawing out your proposition on paper and seeing how it might work out. Set aside regular time in a scheduled timetable (annually, monthly and weekly) to take a bird’s eye view of the business and look at how your plans are working out, particularly revenue, costs, sales, web traffic and average sales. When your business is not doing what you planned, you will know quickly that things are going off track, so you can take time to find out what is happening and take action. This ongoing process of learning is vital to continued growth and survival. 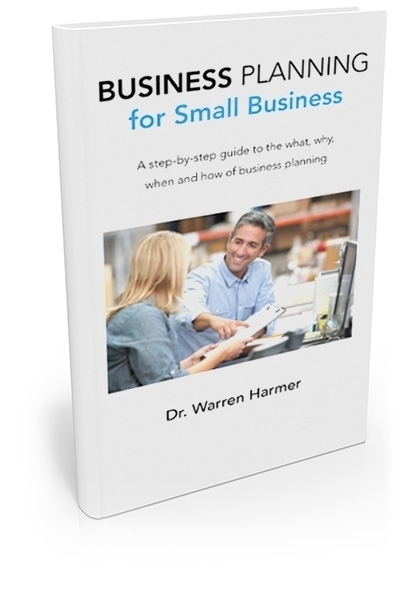 Warren has kindly offered readers of our blog a valuable present: Business Planning for Small Business, The step-by-step guide to business planning for small business. This is not just an ebook about how to write a business plan, but real examples and stories so you can overcome whatever challenge comes your way, based on experiences of real small businesses. It also includes business plan templates, advice on how to execute your plan, and proven strategies to boost market share and expand into new areas. Filled with charts, bulleted lists, and subheads, the guide is a quick an easy reference you’ll refer to time and again. This offer is limited until end of this week, so make sure you don’t miss out. CLICK HERE and you will be redirected to a donwlaod page on Business Plan Company website.